The Stinson L-13 (sometimes known as the Grasshopper, like other aircraft of its type) was a US military utility aircraft first flown in 1945. Developed when Stinson was a subsidiary of Consolidated Vultee, rights to it were not included in the 1948 sale of Stinson to Piper. Mass production was therefore undertaken by Convair, which built some 300 of them. It was a conventional high-wing tailwheel monoplane used for observation, liaison, and air ambulance duties. Following their military service, some were converted for civil bush flying use, fitting a radial engine by Acme Aircraft Company as the Centaur, while others underwent similar conversions by Caribbean Traders Inc, as the Husky. Prototype aircraft, powered by 245 hp (183 kW) Franklin O-425-6 engine. Two built. Production aircraft, powered by 250 hp (187 kW) O-452-9 engine. 300 built. Conversion of L-13A for cold weather operation, capable of operating from wheels, skis or floats. 28 converted. 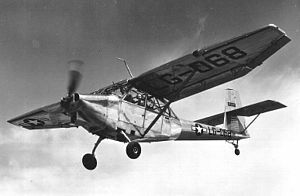 Conversion of L-13 as six-seat bush aircraft. Powered by 300 hp (224 kW) Lycoming R-680-E3. Similar to Acme Centaur 101, with Jacobs R-755-A2 radial. Civil conversion of L-13A. Retained O-425 engine. Civil conversion of L-13A. Powered by 300 hp R-680-13 engine on modified engine mount capable of swinging out for easy maintenance. Similar to Husky II, but powered by 450 hp (338 kW) Pratt &amp; Whitney R-975-7 radial engine. United States Army received 43 ex-Air Force L-13As following the outbreak of the Korean War, serving in the Continental United States to free up aircraft for active service overseas. "Convair Conversion." Flight, 9 September 1955, p. 466.